Because of false positives, alternative links have been added to make it possible to download tools. Hello. I have a problem with cfg installer. I do all how you said, but it is not working. can you describe the problem more accurately? Btw, alternatively you can use NFS-VltEd to import .nfscfg files. NFS TexEdit Download link is broken,please add a alternative link! Is the free import feature for tex-ed still being worked on or what? does that include adding textures to frontb1 and such? Hello dude, can you make a tool which you can extract sfx from NFS Undercover ? I really want there sounds. I asked to A LOT of people, but no one helped me. Maybe you are my luck. Let me explain : I really want to extract sfx from NFS Undercover because there are incredible and I want to use it as personnal use. Extensions are .abk, .bnk, .tmx, .csi, sbs, sbr, .big and that all. If you can help me, you will saving my days and nights. My discord tag is #3822. If you need sounds files, I already uploaded on mega, so ask me if you want the link. Thanks in advance. 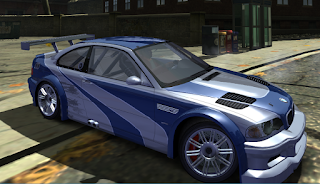 Can you make a program, wherewith to add plus cars for the underground 2? Hi, I have a problem saving, it appears: an error occurred while saving. the changes could not be saved. Need for speed is a very very difficult game to complete. Many races are very difficult to win. Is there any mod to decrease the speed of AI and increase my own car's acceleration? Chrome and Firefox don't allow to download nfsu2 car mods. Also, google and other search engines are performing sactions for sites distributing these mods. I suppose that it's not a virus, but an obfuscation or something. Anyway, it causes a lot of problems. WDYT? okay so I tried using the NFS langed 0.5.0 but apparently it won't open the English global or the English Ingame .bin for some reason or another , and I managed to get the 57 Chevy Belair into the game same with a few other cars . Hi, I have a problem. 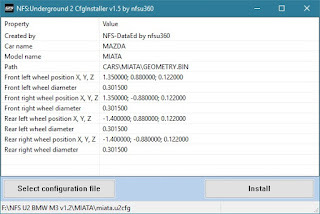 in the program NFS-TexEd v0.9.1 when loading an import, the program does not save. I refresh the program and it's not the import. I would love to download your conversion game of NSF most wanted from corbon canyon. Hello, can you please make an SFX compiler for making custom sounds in NFS, for example Nitro sound? hey can you help me, my changes dont get saved when when i modify things like the sound and wheeloffset, what im i doing wrong? In Need for Speed Payback, there are some drift races. It is impossible to earn enough drift points within the given track. Please make some Mod which will multiply the drift points 5 times during race and race will be finished normally. I used cheat Engine to increase drift point. But at the time of finishing the race, it shows that I have won. but after the cutscene, it automatically shows that I failed to win the race, ''Try again'' !!! So Cheat Engine didn't work to increase drift points in Drift race. And the worst part is that without winning those drift races, it is not possible to approach in the story campaign/mission. So some super cars remain locked for not winning those Drift races. I haven't found any Mod yet to win a drift race easily. Use lamborghni huracan! it is the best car for drift! Use FrostyModManager_v1.0.4.5 and TrafficMod and turn traffic off! Is there any chance for the TexEd to be updated to extract textures from NFSMW 2005 Xbox 360 game since they are double in resolution? Because they seem to be recognized by the tool it just can't extract them due to unknown format. That would be a great addition to the tool. Nfsu360, my Windows Defender found Trojan:Win32/Bitrep.B in NFSCfgInstaller.exe, please check it out. Any way to make Undercover PS2 files readable in the new VltEd? Can someone help with adding new characters to fonts NFS:Underground? Is it possible to open tracks\maps Prostreet? I got a problem installing cars. When I install them, it shows "corrupted GlobalMemoryFile.bin please try to restore original" please tell me what to do? how can i fix the wheels in NFS Carbon? When we can get an NFS Undercover "modtools" ? Where is the original NFS Toolkit used to edit the map section by section? You posted it in 23rd August 2017.
hey, are you able to put a download link fort Palnont city for Most Wanted? Sorry to sound like a broken record. 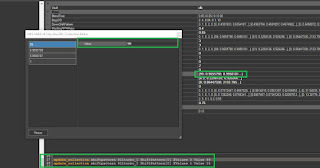 Thought as I see you're still pretty much doing serious modding on the series (mostly the older games), do you mind updating the Language Editor for the Underground part of the games to allow more languages to be enabled in the games. Or better, provide a tutorial on how users can create their own tables (character tables) besides the Polish one that is strictly for the Polish version of Underground 2, for example? I have a problem with a certain .nfsms file. You see, i recently downloaded a mod by LegSolo (link: https://nfsmods.xyz/mod/393). I have inported the .nfsms file, but, when i tried to save, the program said that the changes couldn't be saved due to an error. Do you have any idea why that happened? Thank you. I'M WAITING MORE THAN A YEAR!!! An error occurred while saving. The changes could not be saved.